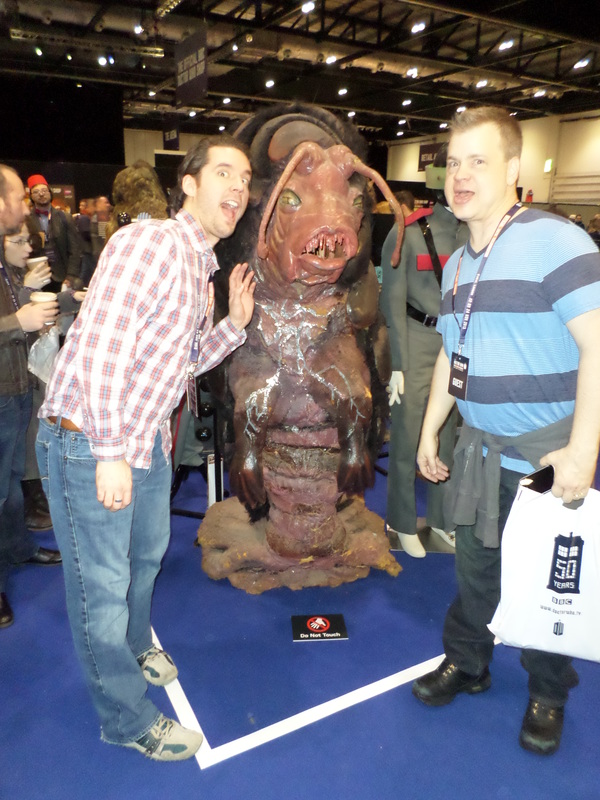 Okay, it’s finally time for my recap of our Saturday in London, pretty much all of which was spent at the Doctor Who Celebration. We had been out just a little bit late the night before with some local friends, so we were feeling just the tiniest bit tender, but we knew we had a great day ahead of us, so it didn’t matter. And conveniently, the friends we were with lived literally next to the ExCeL Center, which is where the event happened, so we knew exactly how to get there. 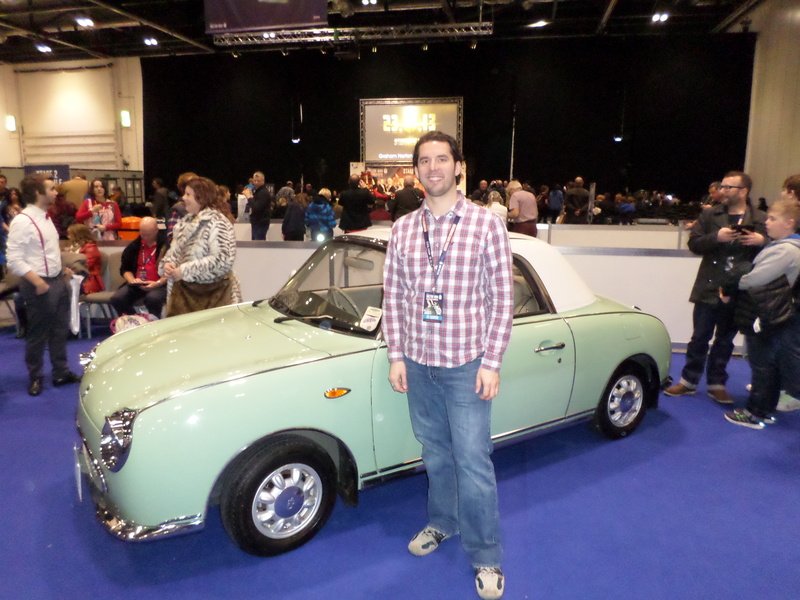 One of my favorite things about London is how easy it is to get around in and that was true for the ExCel as well – we just had to hop onto the Docklands Light Railway from Lewisham Station, just down the road from where we were staying. 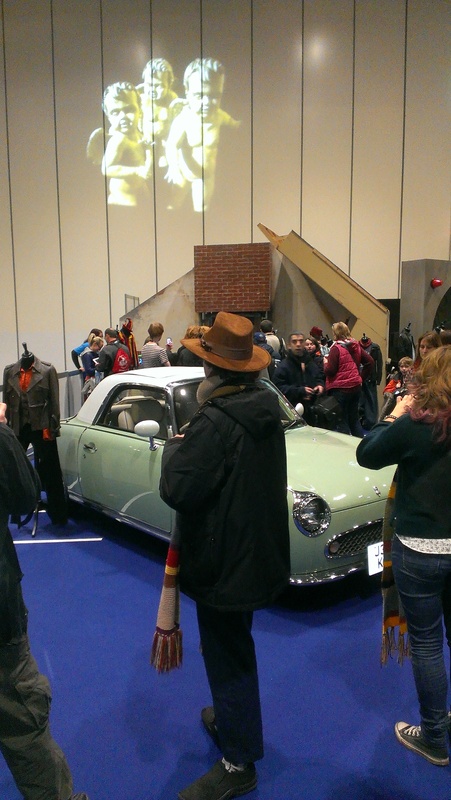 Right when we got to the event, we could tell it was going to be a little bit different than the Doctor Who conventions we were used to because there were SO MANY people there! We were told that they allowed 8,000 people per day there (over 20,000 people throughout the weekend! ), which is far bigger than the biggest Doctor Who convention we go to (Gallifrey One in LA, which gets about 3,500 people). I do have to say that, despite the large crowds, the event did seem to be pretty well-organized, though the layout was initially confusing to us because there were things happening on multiple levels of the exhibition center. 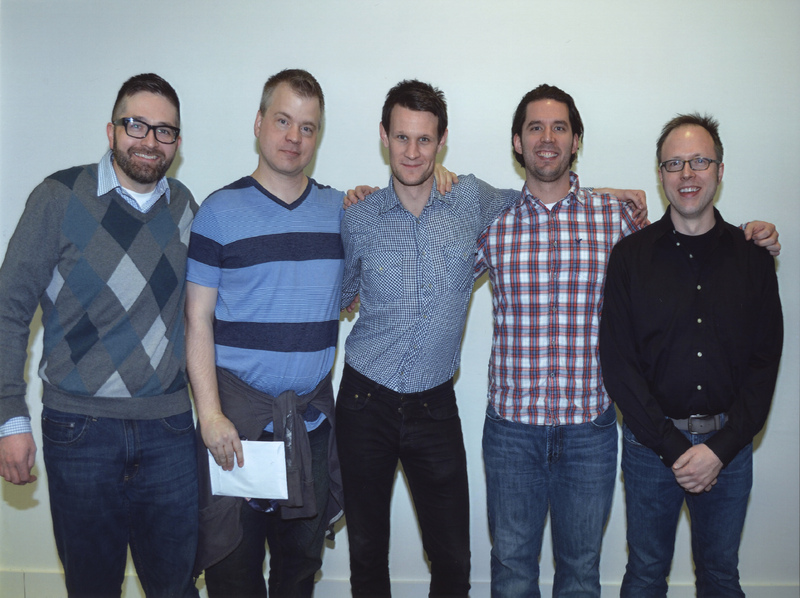 After doing a bit of wandering around to get the lay of the land, our first order of business was to get a photo with the current Doctor, Matt Smith. Although we had booked an 11a photo, we were told it would be a good idea to line up early, so we did that around 10:15a. It’s a good thing we did because, by the time we got out of the photo (shortly before 11a because they started a bit early), it was massive. The photo took all of three seconds, but Matt was very gracious, made sure to make eye contact with each one of us, and asked us how we were doing and if we had come all the way from the States. Very nice! With that out of the way, we spent most of the rest of the day going through the main exhibition hall, which had everything from official convention merchandise, to a pop-up pub (pub quiz, anyone? 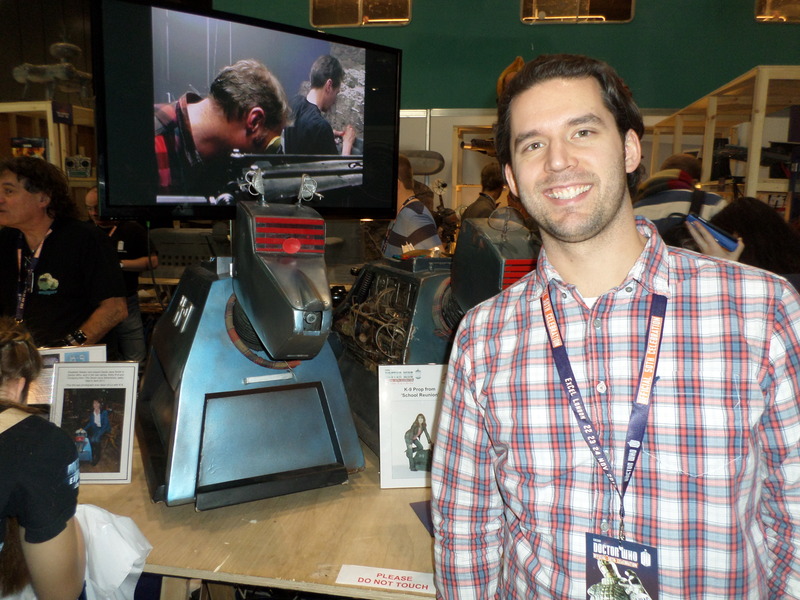 ), to panels with people from the show, to loads of props from Doctor Who and its spinoffs, and more. It was great! Generally, panels are the focus of conventions, so you go to these panels to hear from actors, writers, producers, and lots of other people involved with the show. Although some of those were happening, they were shorter and happening in relatively small spaces. 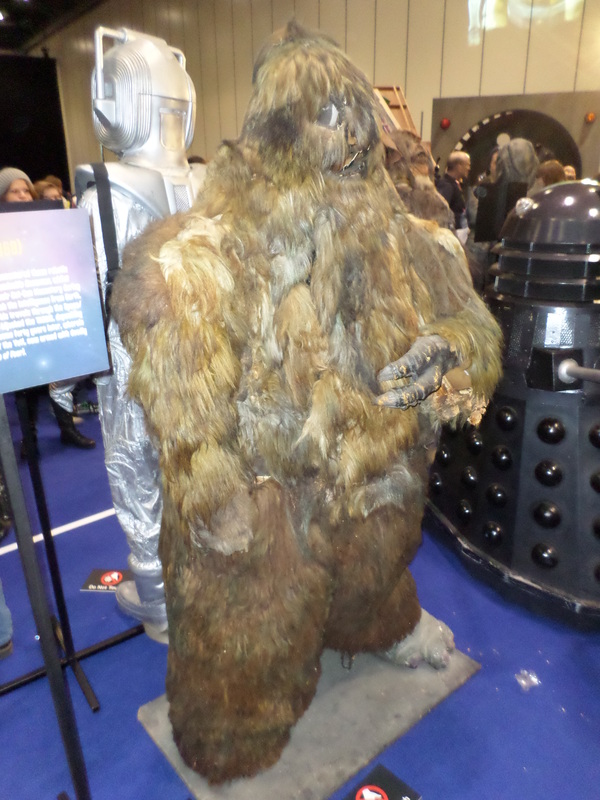 The emphasis was really on the exhibition space, which we don’t really get at other Who conventions. 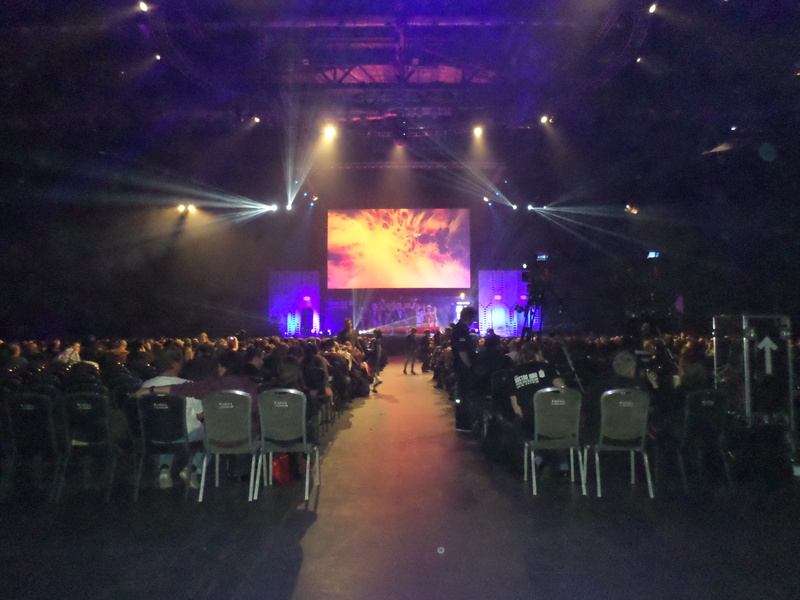 The main events during the day were two panels (actually three, but we skipped the first one about special effects because we weren’t terribly interested) that happened on the main stage, which was housed in a room that easily held a couple of thousand people. 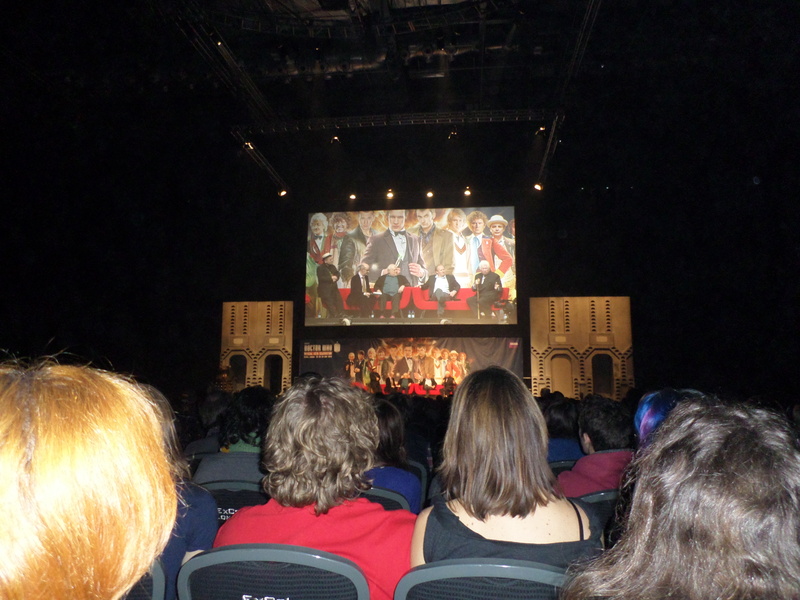 The first one, called Regenerations, was the panel we were really all there to see because it featured four of the Doctors from the classic series – Tom Baker, Peter Davison, Colin Baker, and Sylvester McCoy. We were all particularly excited for Tom because only one of us had ever met him before (and that was many years ago). He’s in his 80s and doesn’t travel outside the UK anymore, so this was likely our one and only chance to see him. Honestly, the standout part of the panel was just being in the room with him! That aside, it was a pretty standard panel, moderated by someone who works in both the new series and on the Big Finish line of Doctor Who audios, and it ended with audience members getting the chance to ask a few questions. The panel immediately following that was focused on the new series and included Matt Smith, Jenna Coleman (who plays the Doctor’s companion, Clara), Steven Moffett (executive producer and head writer), and Marcus Wilson (producer). There was nothing really standout about this panel for me, but it was cool to see all of them on stage together because none of them generally do conventions, except for huge events like this one. 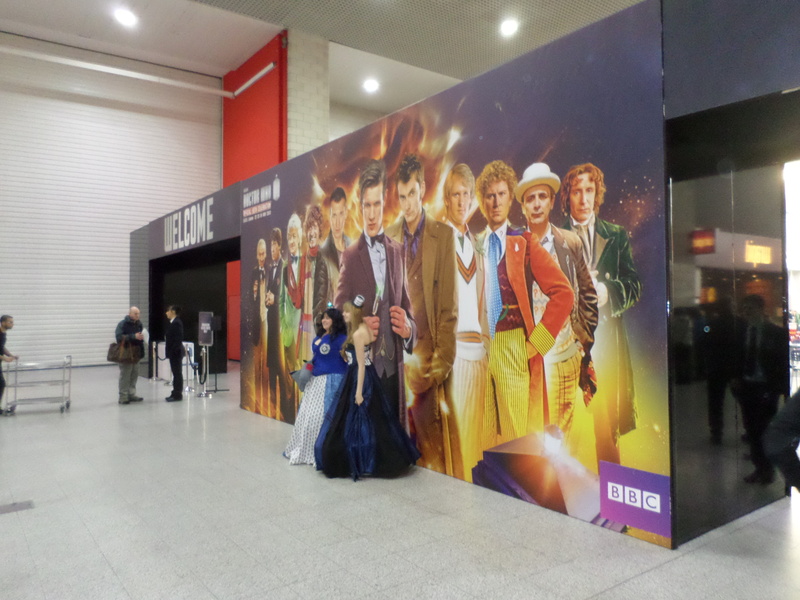 After the two big panels were finished, we didn’t have much else to do, aside from some more wandering and a photo with the TARDIS console. We weren’t at the front of the line for that one, so it took us longer to get through it, but that’s okay. When you can stand around in a line and chat with friends while surrounded by people who love your favorite show as much as you do, the lines don’t matter as much. 🙂 We did manage to run into some friends we knew throughout the day at the event, but the four of us stuck together pretty much all day. The last big highlight of the day was in the evening, when we got to attend a screening of the 50th anniversary special, The Day of the Doctor. Not only was this cool because it was the 50th anniversary, but it was also the first time I had ever watched Doctor Who in the UK as it was airing. And the fact that we got to watch it with hundreds of other fans who were also seeing it for the first time was pretty amazing, too! There was excitement, there were cheers, there was applause – it was great! Definitely a great way to cap off a once-in-a-lifetime event. Now, how about some pictures?? 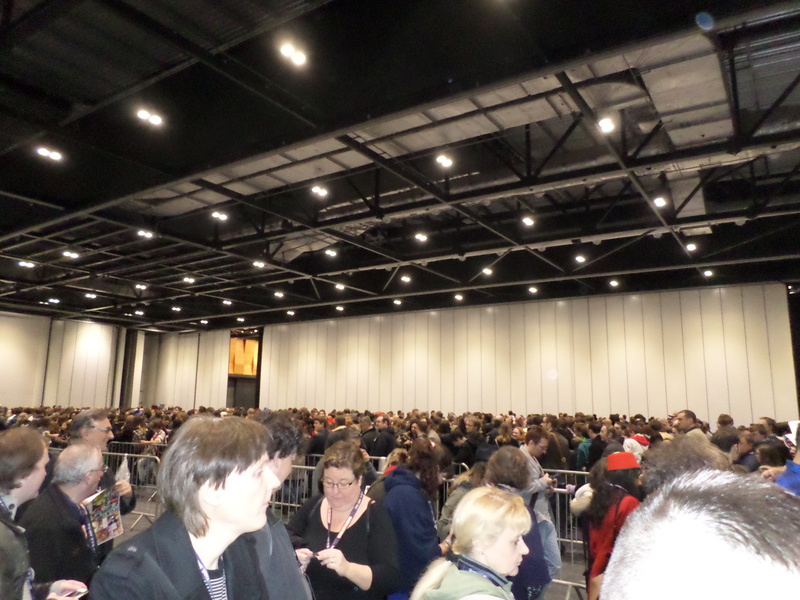 Walking into the Doctor Who Celebration. Feeling officially official with my badge. Just a glimpse into the crowds! Waiting in line for our Matt Smith photo. 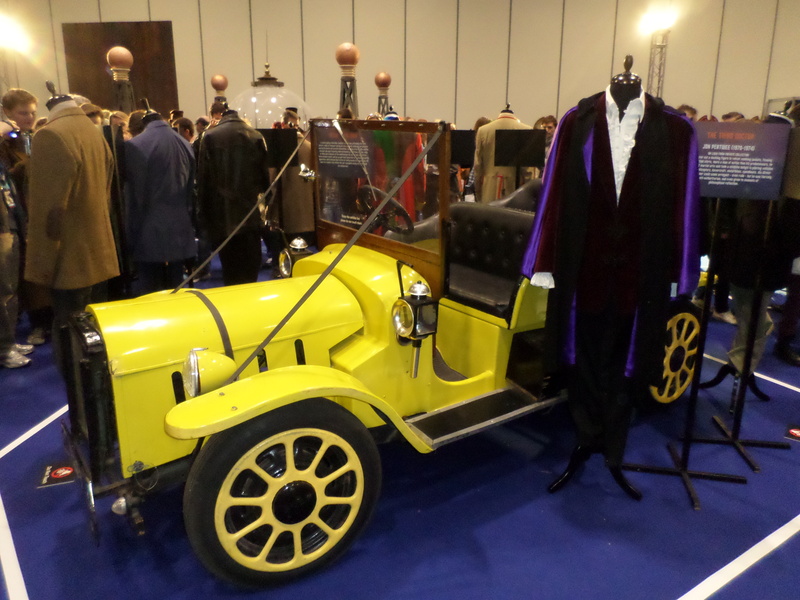 …Sarah Jane’s car from The Sarah Jane Adventures! And lots more, too! 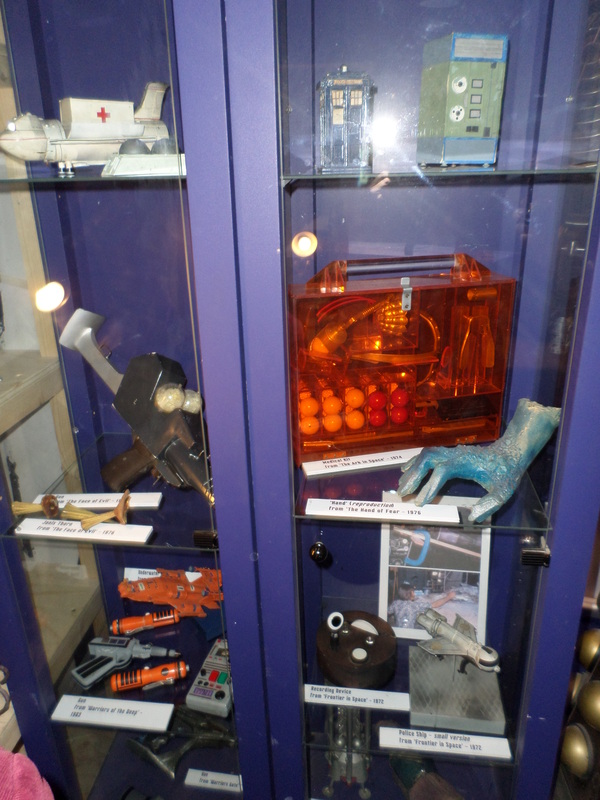 This is a case of various props from the show from the special effects part of the exhibition. They even had not one, but TWO, K9s! 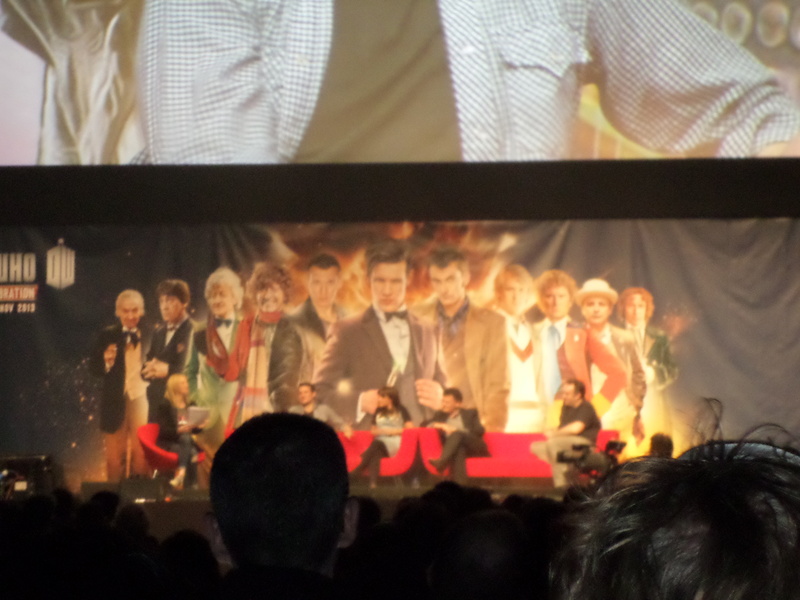 Four Doctors on stage for the Regenerations panel. 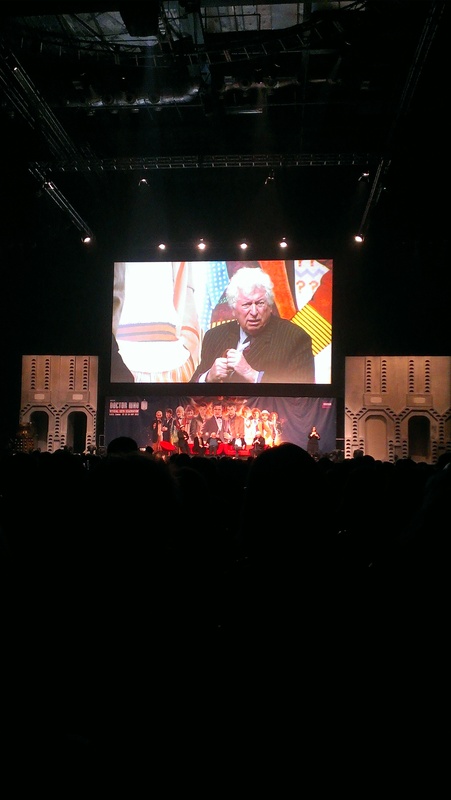 The Fourth Doctor himself, Tom Baker! 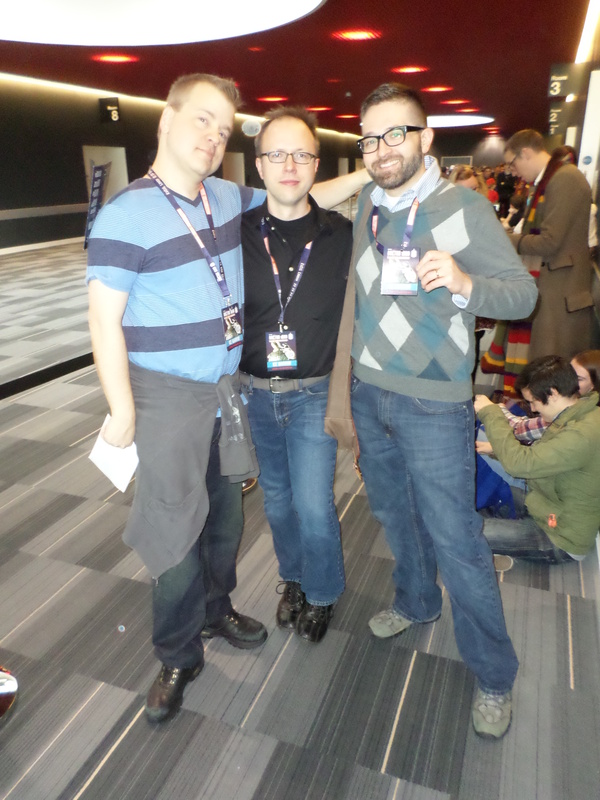 The Eleventh Hour panel, featuring new series guests. 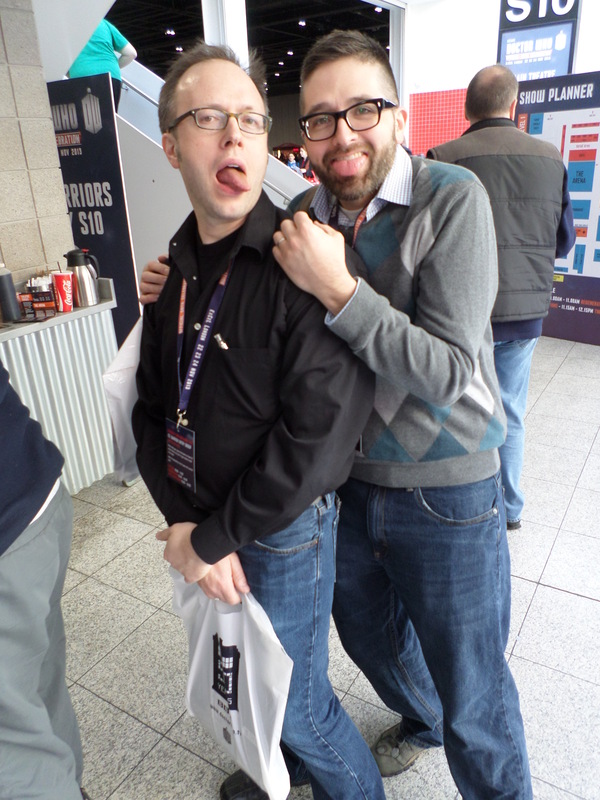 Hmm, probably best to just not ask what’s up with this picture. 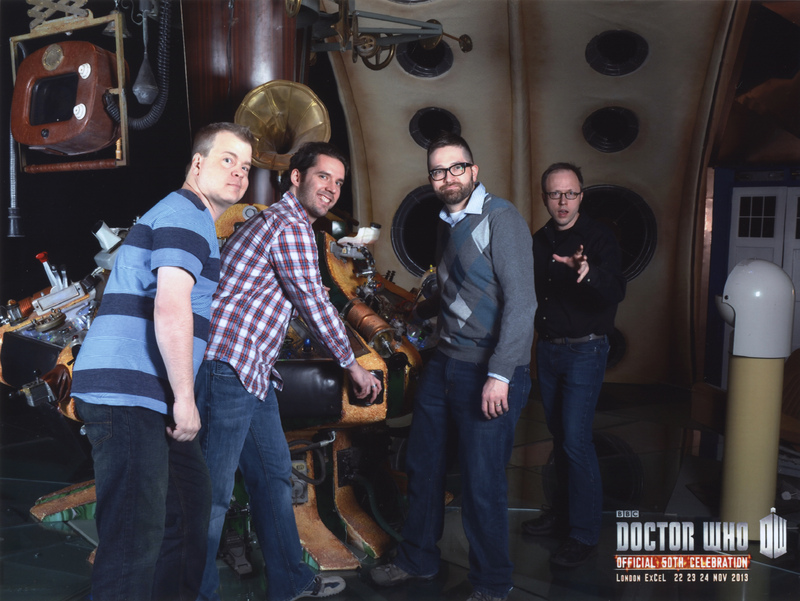 Our TARDIS console photo. Love this one! 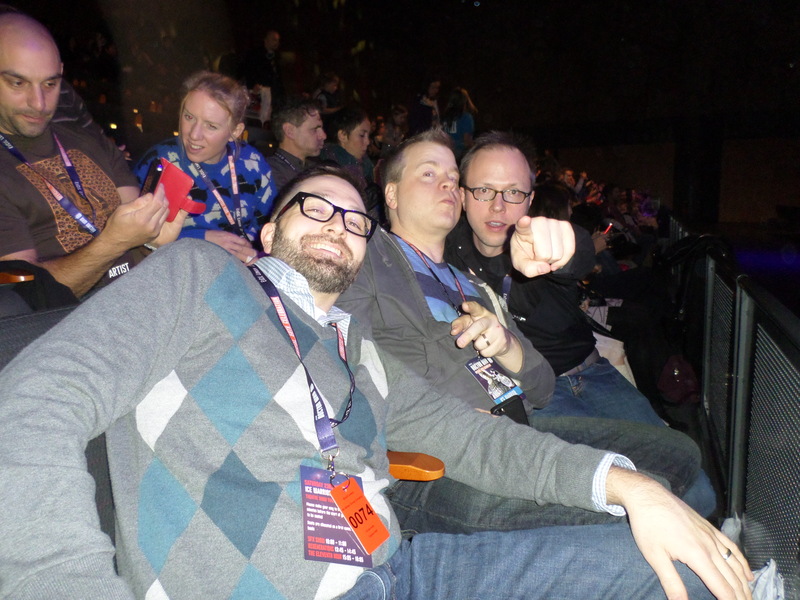 Anxiously awaiting the start of The Day of the Doctor. Bill likes to point. It’s a thing he does. 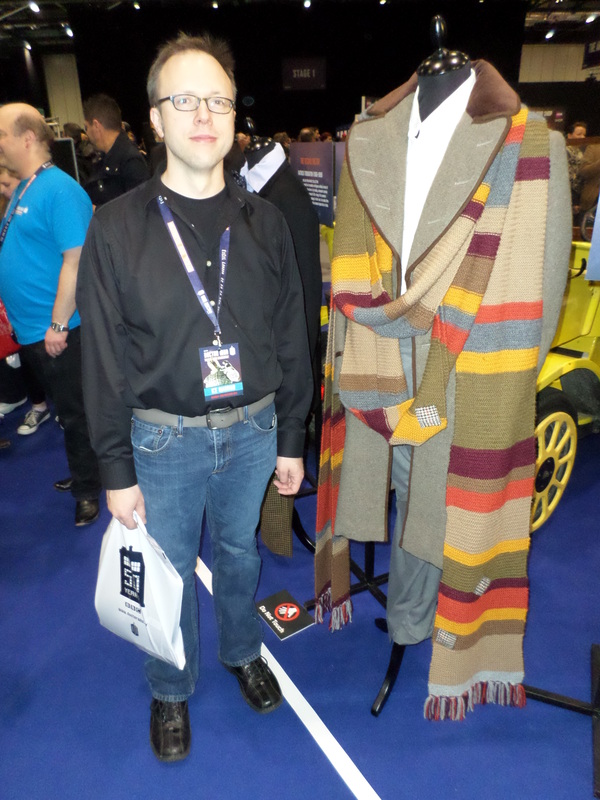 So that was our day at the Doctor Who Celebration! The whole reason we came to London was to attend this event and it was more than worth it. 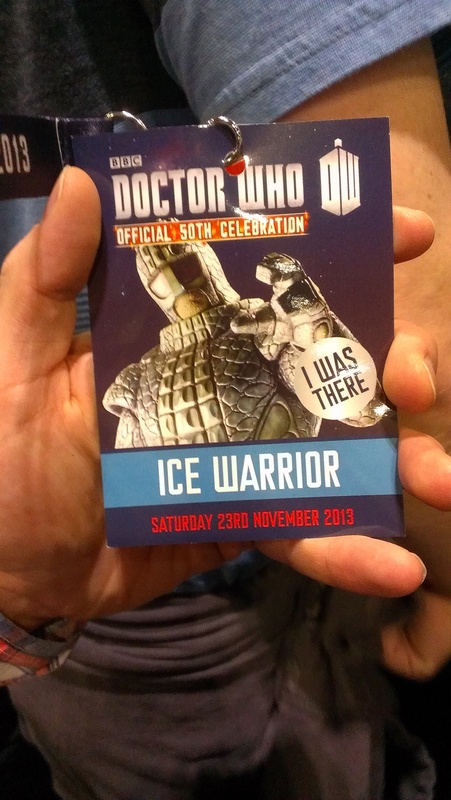 Of course we’ve all been to Doctor Who conventions before, but the 50th anniversary only happens one time, so coming to this and spending time with great friends surrounded by the show that we’ve all enjoyed for so many years was truly a once-in-a-lifetime experience. Now counting down to the 75th anniversary! I never saw those props! OMG! The medkit from Ark in Space!